The Joint Admission and Matriculation Board, JAMB 2019/2020 Examination Date has been officially announced. And JAMB 2019 Form is NOW on SALE. The Jamb UTME 2019 Examination commence from Thursday, 11th April, 2019. All the applicants who applied for the exercise are advised to prepare adequately for the examination. The Jamb 2019 Form is now on sale. He equally stated that the board is taking into cognizance dates of other public examinations (i.e. WAEC, NECO, etc). Prof Oloyede made this known during a meeting in Abuja on 5th January with stakeholders on the plans and programmes for the 2019 Unified Tertiary Matriculation Examination, UTME, and Direct Entry, DE. The JAMB board equally warned candidates against falling victims to fraudsters and advised them to only rely on the official information from the board. Despite the fact that the Board is yet to announce the date for the commencement of 2019 UTME registration, I think With this, candidates can now be rest assured that the 2019 UTME will still hold and be able to prepare adequately. 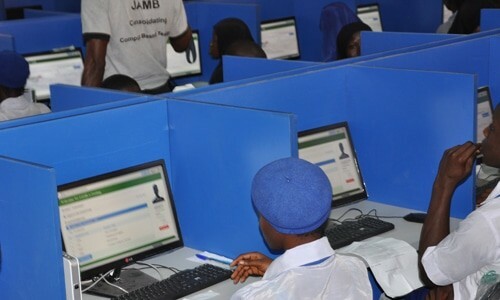 All the Jamb candidates have been directed to re-print their registration slip by visiting any JAMB accredited Centre or cybercafé from 2nd April, 2019 to know their exact exam date, time of examination and venue. Click Here to Reprint your Jamb slip online. Candidates are also advised to arrive at their various centres/venue 1 hour, 30 minutes before the scheduled time and ensure they adhere strictly to their exam date, time and venue as anyone who misses his or her examination will have no opportunity to write it again. Nigeriaschool.com.ng team wishes you all the best. There is no exact date for now. We will inform you when Jamb officially announces the date. I wish jamb could’ve started the reprinting of slips as soon as the they could. pls you guys should bring out jamb form, have never seen a situation when waec comes before jamb. The Date has not been officially announced. However, Jamb has released the List of Approved Centres for 2017 UTME Registration. So the date will be out anytime soon. Let all the centres ensure that thier computers are in order so that they don’t disappoint any student after serious preparations. Let all the centres ensure that their computers are in order so that they don’t disappoint any student after serious preparations. Why didn’t it showed up? Did you indicate why registering that you will sit for the mock exam? But there is no worry, the exam is not compulsory. Jamb exam starts from 13th May and it will hold for 1 week. Please print out your slip to know your own date. I can’t print it…d pop up is giving me issues…can u reprint for me??? If you provide me your details. I will send it your email and you can print it out from any cybercafe/business centre. But that is a long process, just head over to any business centre and ask them to print it out for you. It has not been concluded. how sure can you tell me about admission for Isamis studies in bayero and umyu for a lagos citizen. will he be considered ? Of cause. All candidates are considered for admission. I am Clifford Jude Brain… I registered for jamb utme exams and up to this moment, I have not been posted for my exams…. do you have access to your Jamb profile? Please go to http://www.jamb.org.ng/PrintExamslip/PrintExaminationSlip and enter your email and password to view your exam date and centre. how will i know when I’m writing my jamb exams the date please? when is the date for jamb 2018 exam and re-printing day please? Reprinting of Jamb examination slip has commenced and the 2018 UTME will starts on the 9th March. how will i know when am writing my jamb and date please? The sales of JAMB 2019/2020 form will be out starting from November, 2018 or thereabout. The price is still going to be between the range of N4,500 to N6,000 for everything. I guess you mean Jamb 2019/2020 form. It will be out before the end of the year. It depends on your school of choice. I used awaiting result, how do I correct it before the exam date, can I correct it in any cyber cafe. . . . The Exam date has been postponed. is the official date for jamb fixed? Yes. Please check the new date! The new date has been updated on the article. Have they started reprinting jamb?? Not yet as the date has been postponed. up till now I have not gotten my exam center and exam date please am confuse. You don’t need to be worried, the new date has been adjusted. No. It has not started yet. please when will Jamb re-printing start? It is starting today, 4th April. When will jamb 2019 examination start??? The closing date: 15th March, 2019. If your JAMB slip is showing 17th April, that means there is going to be exam on the 17th. So there is nothing to worry about. 2019 UTME Results not out for now. Sir Please when is thé result of 2019 jamb be out ? According to JAMB. It will be out anytime soon. How soon, we do not know.